Robert Hoaglan, Oxnard California on the California Central Coast. In internet vernacular, I'm a newbie at worm wrangling with only about 4 months under my belt. I started with a Walmart 32 quart tote and 2 lbs of Red Wigglers and a bedding of Peat Moss buffered with Dolomite lime and green sand for the needed grit. No drain holes or ventilation holes, I just cocked the lid for ventilation. I mainly fed grain but would occasionally add some frozen blended rinds and vegetable trimmings. About three weeks into it I could see that the process was going better than I had thought it would, I decided to increase my herd and bought another 2 pounds of Red Wigglers. This time I decided to house them in 5 gal buckets, based on Larry Halls video. Again I pre prepared a bedding of Peat Moss, Dolomite and green sand. I divided up these RW into three 5 gallon buckets. Again, with good success. I was a happy farmer but not completely satisfied with my two setups. In comparing the two setups, the tote verses the buckets it was apparent that the buckets offered a better way to fluff the bedding. I could tip the buckets upside down, roll them a bit and then right them and my bedding was fluffed and aerated. The worms might be a little dizzy but it didn't seem to bother them. The tote had a much greater surface area to induce breeding, and I did want to expand my herd. 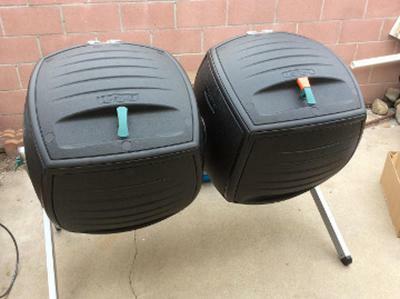 A new member to the Vermicomposting group site, Stephen Forrester, offered the solution I didn't know I was looking for...Worm farming in a compost tumbler. It seemed like exactly what I was looking for. I could easily fluff the bedding on a by weekly schedule, there would be plenty of surface area for the worms to spread out and multiply and the bins could be easily emptied. My problem was, I didn't have a tumbler. Well that was until I went to Costco one day. And wouldn't you know they had my worm bin right there on display where everyone could see! It was a dual 50 gallon tumbler. 100 gallon capacity with each bin having a mean surface area of 2 square foot at mid point. Meaning that if the bin was filled half way full the surface area would be 2 square foot with a bedding depth of around 11". I agonized over it for a week, checking prices everywhere they were sold and then I just went for it, I bought the one from Coctco. Assembly was a little tedious and there were some areas where I thought rain water might enter so they needed to be calked up. Other than that, it was a ready made bin. I put my bucket worms in one of the bins and the tote worms in the other bin to keep the colonies separate. They seem to be thriving in their new environment. I had a little setback in one of my bins with an infestation of ants but now that is corrected and both colonies seem to be eating well and probably multiplying at a good rate. My goal is to build the two colonies to the point where they stabilize, about 12,000. At that point I should have a "conveyer belt" of castings to meet my needs. At this point I have tumbled them several times to fluff and aerate the bedding and that worked as expected...no revolt from the worms. By the next day they were up on top eating again. And by the way it is a great way to mix cross cut shredded cardboard into the bedding and I think the worms enjoy the carnival ride. 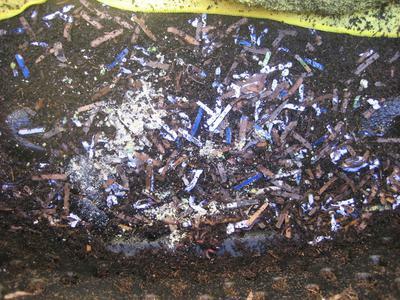 The known is the worms seem to be thriving with the greater bedding surface area, bedding maintenance is simple and very easy and the working height of the bins are perfect. The unknown is harvesting and mass exodus in rainy weather. My plan for harvesting the castings is to place a mortar tub under the bin and rotate it with the lid open, as you would if it were compost. Then sift the castings out of the mortar tub manually. My plan to control mass exodus this winter, if it ever rains again in Southern California, is to keep in tough with the good folks at the Vermicomposting group...they will be able to brainstorm a solution. So it is still very new but so far the system is working great and I don't anticipate disaster. I am in zone 10a so I don't need to move this bin inside or heat the bedding during the winter. 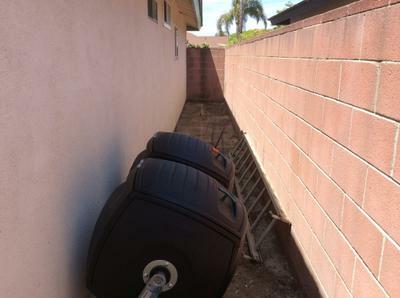 However I was concerned about overheat in the summer though, so I placed these bins in the most shady spot I have. The area selected has an east exposure and in between the house and a block wall fence. This area only gets direct sun for about one hour per day year-round and shade the rest of the day. 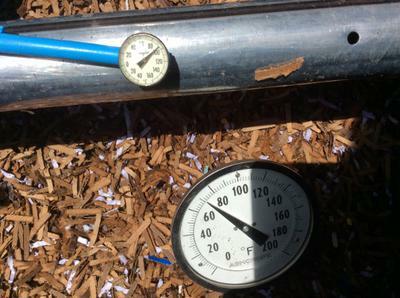 With the large bedding mass I didn't think one hour of direct sunlight would raise it's temperature much. that the location I had selected was suitable for my worms. So, although we are all in it for the benefits that Vermicomposting offers, we all have different environments to work around, different goals to accomplish and different ideas on the best way to perpetuate the outcome. I don't want to say that my system is best for everyone, it's just another way of doing it. Depending on your climate, it could work for all types of composting worms. So if you can work a tumbler into your situation then I would suggest you give it a try, the benefits are there. So there you have it, my "Worm Farming Revealed". Thanks for reading my very lengthy explanation of how I worm farm. I hope my story inspires just one person to step up and say, "your totally nuts"! You're a Verminut (in a good way!) It takes a lot of courage tumbling around in your head to prove that You CAN worm farm in a compost tumbler. Many think it's not a suitable environment for worms but really all you need is "something" to hold everything and then do like you did. 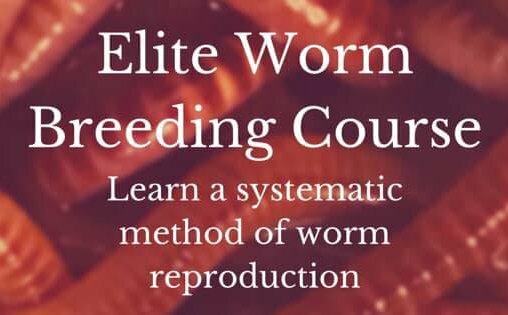 Robert, you've put your whole herd into worm ranching, and I applaud you. Lots of good advise and helping to take the mystery out of the start up. Looks like you have the right idea using those compost tumblers....Keep up the good work. Looks like a lot of thought and effort went into this project and the bins should work well. Cool Idea using a compost tumbler as a worm bin. I have a homemade 55 gal plastic barrel compost tumbler I made. As constructed it wouldn't work well as a worm bin but with a couple of modifications to the design it would. I will be making one of these in the next few weeks. Thanks for the idea. Jamie, depending on the axis of your DIY tumbler they can get very heavy to tumble. I'm referring to the design that has the axis such that the drum tumbles end to end. The design that spins the drum on a horizontal axis will be easier to work with. Either way as your bedding builds in the drum you will be able to tell when enough is enough. At that point allow all the bedding to completely decompose and harvest. One other point is the design of the door. It should be strong and with a good locking system. Working height is also another consideration. Good luck and post some photos of your completed tumbler. Robert, this is so clever. What a great way to be able to manage the moisture that can build up in the bottom of a bin. Great idea! It is very important to aerate the bedding often. I'm amazed that most of the worm bins I've seen get enough aeration. This system looks like it may produce ideal conditions for the worms. You need to be careful that they don't get over crowded or the compost don't heat up too much. The worms need a place to go when it heats up. I would be concerned if turning too much would heat up the whole bin. Do you see that as a potential problem? Dale, no I don't see my bedding heating up. I grain feed and use buffered peat moss and a little cardboard as bedding. However if I fed kitchen scraps that could become a problem if the balance was off. Thanks for your comment. I have a tumbler in my small greenhouse that has been producing vermicompost for the past ten years. It all started by accident. I added a finished tray of vermicompost from my Can O Worms system and the rest is history. Apparently there were plenty of cocoons and baby worms in the tray and they seeded the tumbler. This was a very happy accident because the tumbler produces the best vermicompost there is. I throw in yard waste and cuttings and just about anything organic and green you can think of, turn the bin a couple of revolutions and make sure everything is covered with the compost. When I need some vermicompost I turn the bin so the bottom comes to the top and I take a few handfuls out, sift through a handheld sifter, remove any straggler worms, and use the compost. This compost is very black and fine in texture, never clumpy like it is in the Can O Worms. Good luck with your bin, I think you will be very happy with the results. It used to be just a myth of old worm-farming folklore that using a compost tumbler was not possible. However purposefully or by accident or maybe even that's just all someone has to use at the time is more proof to me that worms are much tougher than we give them credit for. Thanks everyone for your comments. I love reading them and try to keep up as much as possible.